I'm now collecting names for Essex Road Relays in Chelmsford on Sat 20 March (2.30pm start). All members with Essex qualification (i.e by birth or residence) welcome. 4 runners per team for men/ 3 for women's team - each runner does approx 3.5 miles. Already have Richard F and Becky (who is coordinating women's team) confirmed. Let myself (men) or Becky (women) know whether you want to do it in the next couple of weeks. Mark, since the change of date (21st) I'm not going to be able to make it. Essex events this year are.... very annoying. That is bad news Graeme, was Kate doing them, if so is she still able to? Any one else up for it? Now the date has changed to the 21st, I can do it. think kate is out too... unemployed??? Update - I'm now able to run... but will have raced the bike in the morning, so won't be fresh. I think that makes about 5 men dropping out, Mark can confirm. Looks like we will be struggling to make up the mens teams. Any men out there fancy stepping in please let us know asap - thanks. I think Colin might be able to run. He did say he could do it a while ago, but at that time there were no spaces in any mens teams. I know Ann is running in the ladies team so he may well be available. I will be seeing him at swimming tonight, so i will ask him. Just been in contact with Colin. He's available to run. Thanks Russell, we can sort out the final details with Mark tomorrow. Ideally could do with one more, might be able to use some gentle persuasion on Matt K or Richard N.
Don't need to finalise teams until 30 mins before start, but will need DoB, Address, whether qualidfied by birth or residence in Essex before then. Full details at link from Events page on HR website. Post code is CM1 2EH for those lucky people wit a sat nav. Let me know if any more drop-outs. Just a quick word of thanks for organising this thankless task - I was absolutely awestruck at the turn-out today from Harwich as well as the inevitable cheering, bellowing, encouragement and cake-baking for which we are, rightly, becoming infamous and famous...but mostly famous. Even Bondy's 'Bobulous' hat made an appearance with its one-careful owner. 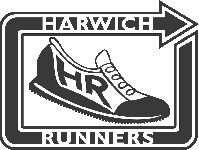 During my D-leg I kept seeing runners in the distance and they always seemed to be Harwich Runners that I was a-chasing! Really glad I finally made it to one of these after all the years: a fantastic way to spend a Sunday afternoon and well done everyone, runners and supporters, for being involved. Thanks Gary! Really enjoyed today-fantastic turn out from the club-both runners and supporters! Thank you ladies for making my job easy today-much appreciated Really impressed with the attitude to all this....some of the local clubs didn't bother to put any teams in at all, while we had 10. Definitely the loudest support as well-I was stifling a giggle on the start line at all the bellowing going on before we'd even begun God knows what Roly made of the cheer he got as he finished! Great turnout, well done to all that run, and thanks to Tanya for marshalling, hope you all enjoyed it. Forgotten how hard 5k races are, think I'd rather do a 20 miler when you can at least take it a bit easier. Got the results sheet through is morning. I'll bring it down tonight and will also try to get it scanned when I've got time. As we thought, very strong top men's team confirmed in 5th place. Performance of the day for me though was Paul Mc in his first race since his illness with a 24.53. Where did the ladies finish? No-am still eagerly waiting! Is it the timings that are wrong, or did I get the teams in a muddle? Thanks Richard, that is quite a difference, others have said the same. I will keep a note. Sorry, I'm no help with the timings, as I don't wear a watch. It was the positions which didn't tally - re Karen's run.